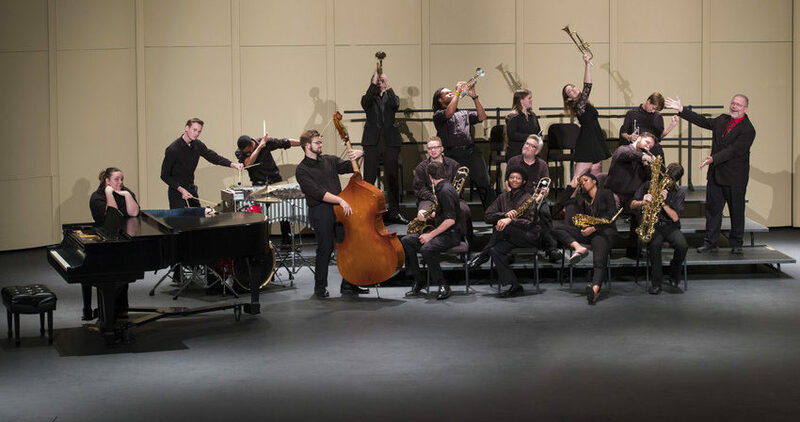 The University of Lynchburg Community Big Band invites music lovers and dancers to the Spring Swing Fling, a swing dance with live music from 8 to 11 p.m. Saturday, May 11, in Memorial Ballroom, Hall Campus Center. The band will play swing-era favorites by Glenn Miller, Benny Goodman, Tommy Dorsey, and others. Hors d’oeuvres will be served and a cash bar will be on site as well. Tickets are $30 per couple or $20 per person in advance, or $40 per couple and $25 per person at the door. Tickets are available at www.lynchburg.edu/spring-swing. Proceeds will benefit music programs at the University of Lynchburg. In addition to educating students in a nationally accredited program, the University produces more than 40 concerts and recitals every year and sponsors Music Bridge, an award-winning program that provides music enrichment programs to local youth. “The music department seeks to enrich the life of the University and community by providing opportunities for musical expression and growth to all University of Lynchburg students,” said music professor Dr. Chris Magee. Dr. Magee founded the University of Lynchburg Community Big Band in 2014 to give jazz musicians from the greater Lynchburg community an opportunity to perform big band jazz in a variety of styles. The band performs in fall and spring jazz concerts at the University, and it is also featured in the annual Wind Symphony and Orchestra Holiday Concert and Night at the Movies Concert. For additional information on the Spring Swing Fling, call 434.544.8344.